Seduction, glamour, corruption, drugs and raucous poolside parties: the life and times of scandal-plagued Silvio Berlusconi have long-demanded a screen depiction, and who else to deliver it than Paolo Sorrentino, the Academy Award-winning director of The Great Beauty and The Young Pope, who returns to cinema in spectacular fashion with this dazzling, topical and no-holds-barred look at life in Italy under the glistening eye of modern Europes most infamous politician. 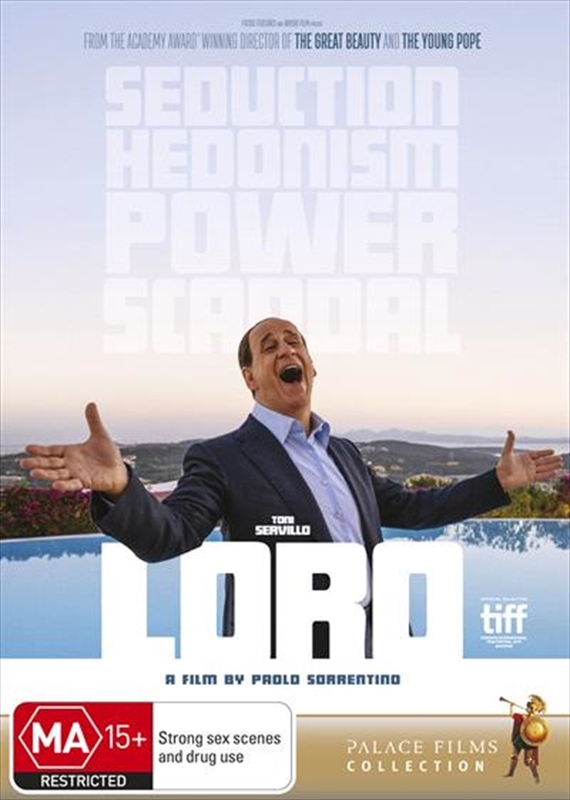 With Loro, Sorrentino gradually unpeels the complex personality and motivations of the billionaire former Prime Minister played with unmistakable panache by Toni Servillo during a tumultuous period in his career, as his marriage to second wife Veronica Lario (Elena Sofia Ricci) fractures; all the while skilfully threading together stories of a wide variety of characters from multiple levels of society and their attempts to either ingratiate or distance themselves from him... Boldly and controversially speculating on what may or may not have taken place behind closed doors, LORO (which translates as 'Them') offers a timely commentary on the excesses and follies of the power-hungry. Viewers sensitive to depictions of unfettered wealth, power and debauchery: consider yourselves forewarned. Everyone else: strap in for a wild, unforgettable ride.